Parenting as Infographic, Installment #1 | Laura's "Rules"
This entry was posted in Parenting and tagged attempt, Colin Delaney, comedy, Data point, droll, Edward Tufte, funny, Giggle, guffaw, humor, info-graphic, Infographic, information, Information graphics, informative, laugh, LOL, mommy blog, nutritious, parenting, poll, snorfle, wit by Laura MacCleery. Bookmark the permalink. 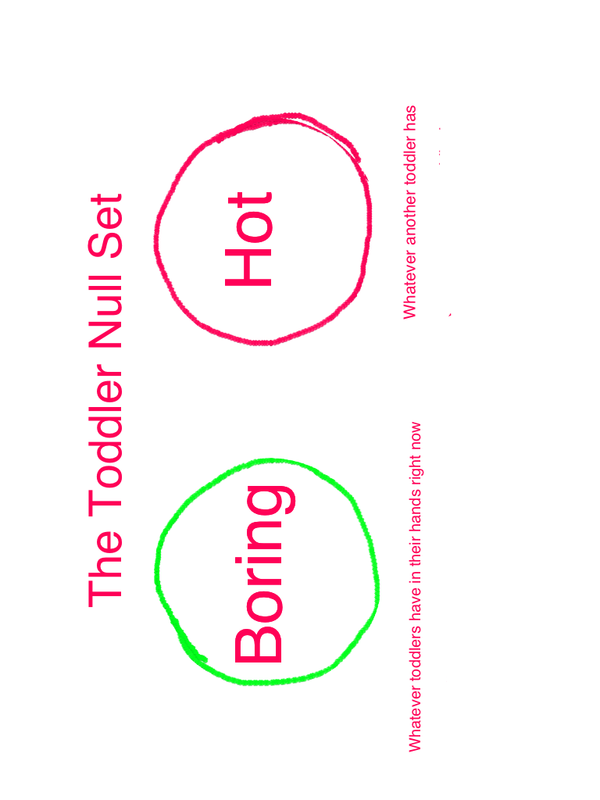 Here’s a (naive) question from a non-parent: Assuming a symmetrical 2-toddler scenario, doesn’t the tension implicit in your Null Set solve itself? Put another way, do toddlers evincing the boredom/envy you depict ever just trade objects, then trade again, and again? And yes, by bringing this sort of unreality to my ideas about policy and solving social ills, I find that I am frequently disappointed by the world. This is very evidence-based and accurate on all points. While also achieving a high standard of lol.